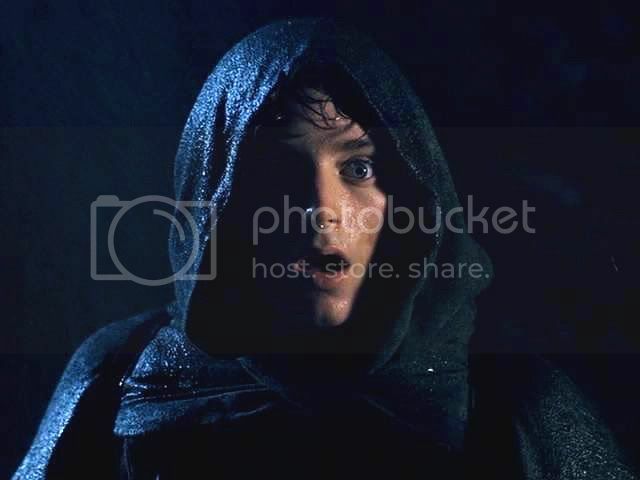 The next set of FotR screencaps I made are from the opening of the sequence at Bree. 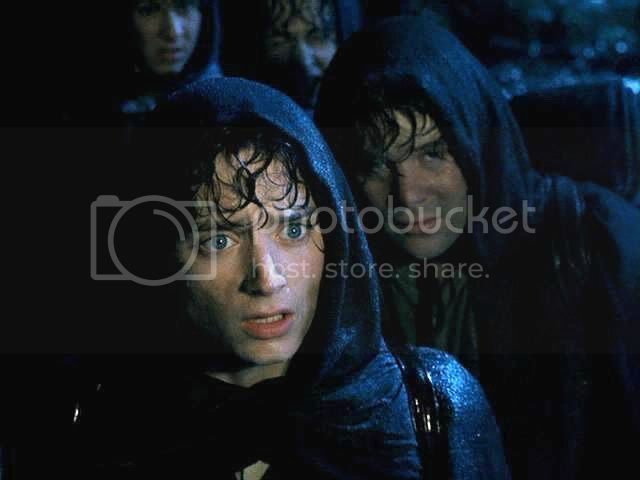 The gatekeeper opens to them at last, the light of his lantern thrown over Frodo's face as he makes their case. 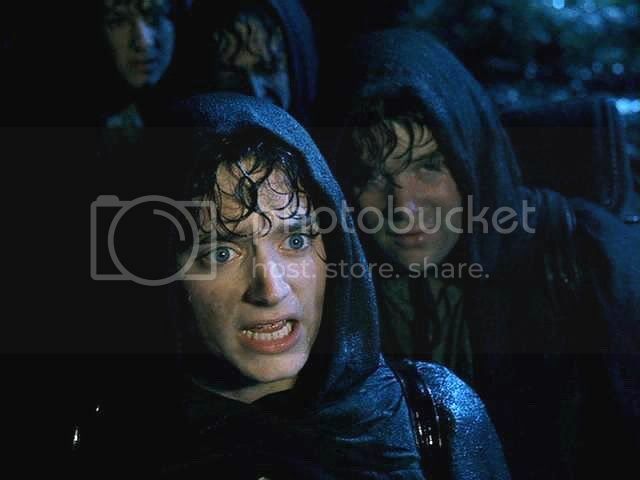 The gatekeeper is suspicious and keeps them standing. Frodo obviously shares in the fatigue of his companions, and is fully aware of the hobbity misery at his back. 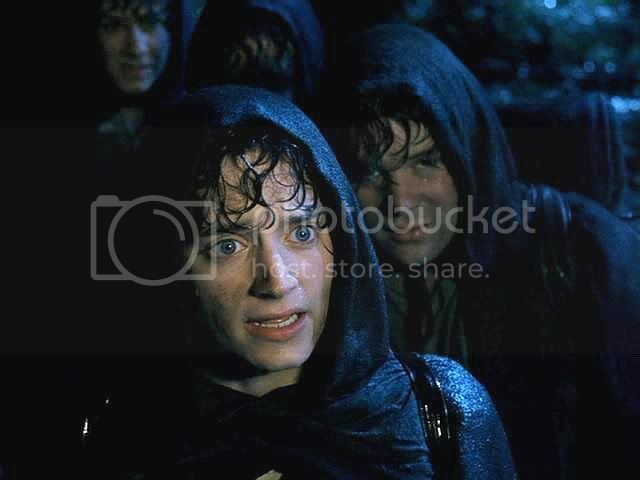 Without losing his dignity, Frodo presses their suit for admittance. He moves from tones of polite request to anxious plea to exasperated demand, all in a few short speeches. 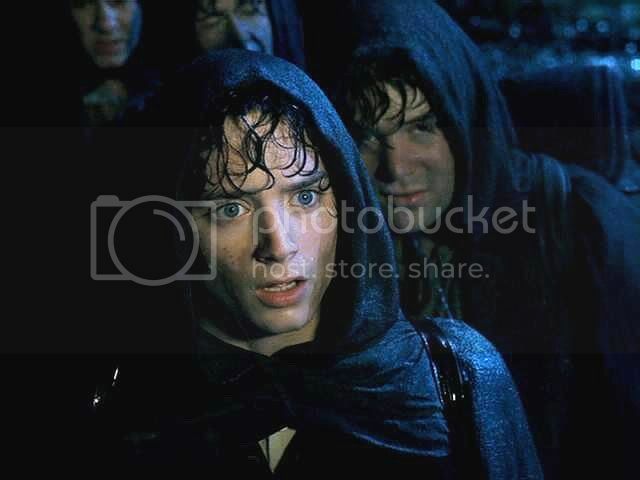 Frodo is tired and testy, and the gatekeeper had better look about him -- and open that door. 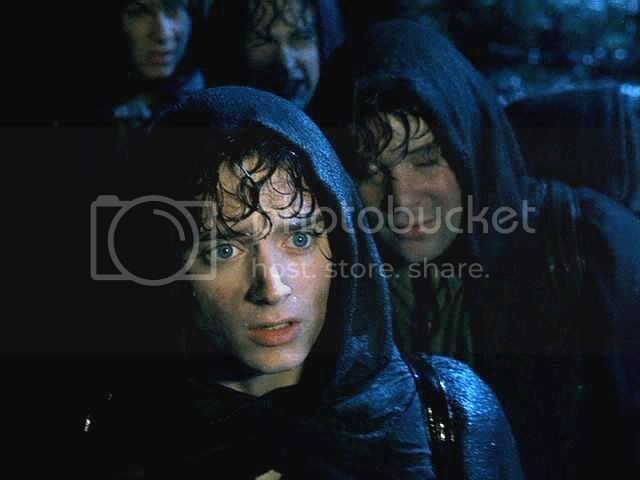 The last two shots are from the briefest flash of Frodo's face, a reaction shot, after he sees the sign of the Prancing Pony swinging over a door nearby. 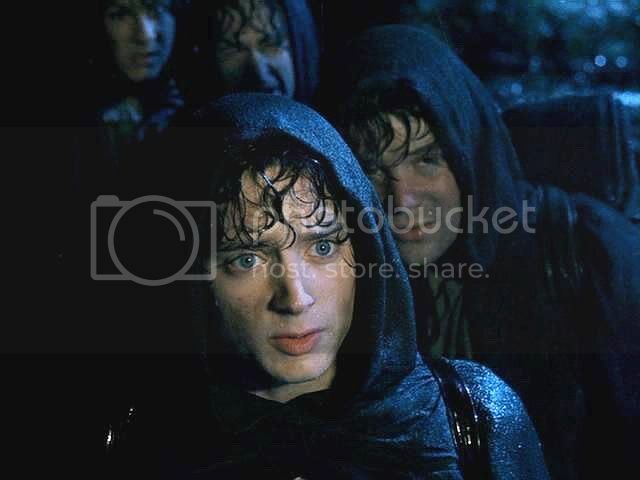 Especially in this first series of shots, I was struck by how mature Frodo looked. Perhaps it's just the set of his face, especially around the mouth, when he is having to be adamant and forceful. 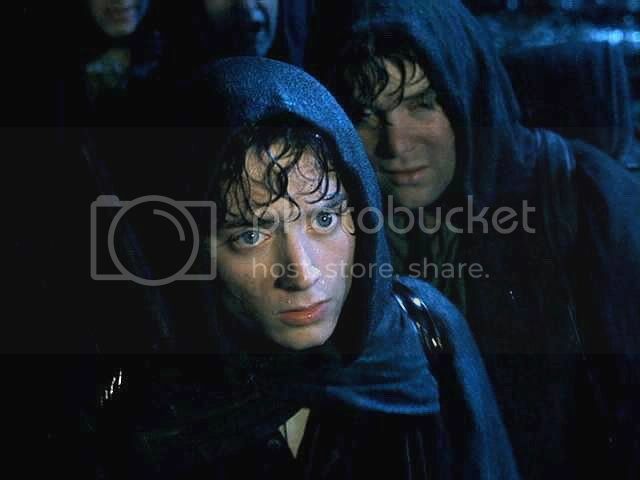 Scrolling through these, I felt as though I was seeing Frodo's face (and Elijah Wood's) many years hence, not his face when he was setting out. The tension around and in his mouth as he speaks, greatly diminishes the young, dewy look of those lips so many of us have longed to pluck and taste like early-summer fruit. 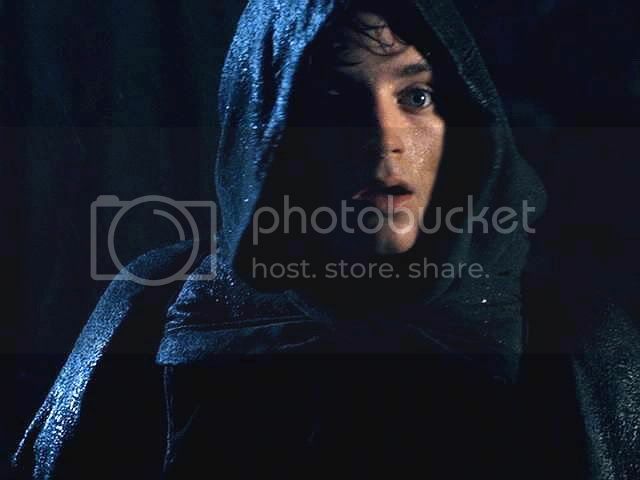 In fact, had the filmmakers done the book version of the passing of years in FotR (in which Gandalf does not return after Bilbo's Farewell Party for seventeen years, not the year implied by the films), this face of film Frodo would be about perfect. 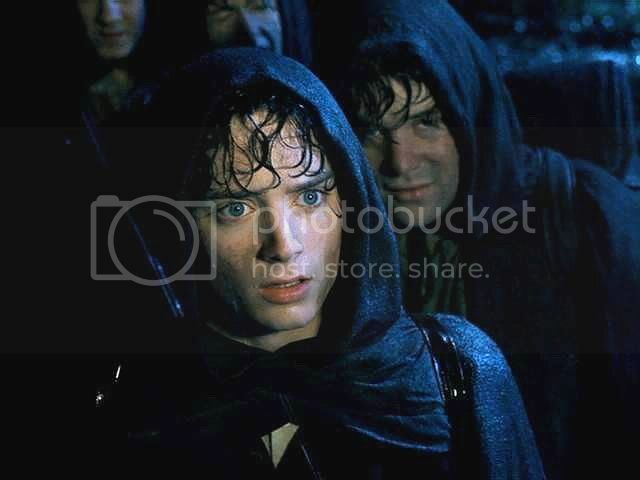 Technically, he doesn't look any older, and neither does book Frodo (since he is in possession of the Ring for those 17 years). But this face seems to bear the marks of years of experience, a face that time has chiselled, even if subtly. It is quite different, to me, from his usual soft-faced look. Although I have lightened and sharpened these images, they still are rather dark. Viewing them in a darkened room is helpful. 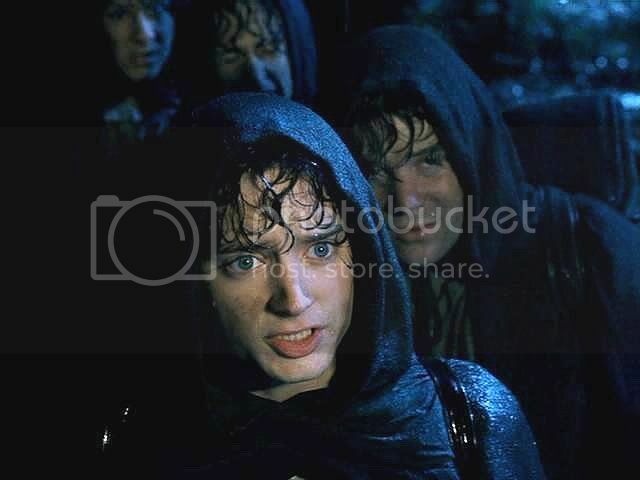 Here are two frames from the moment when Frodo sees the sign for the Prancing Pony. Now, there are those dewy, ripe-fruit lips again. Heh. I love that 'chiselled', sculptured look. How black his curls look, plastered glossily against his forehead. 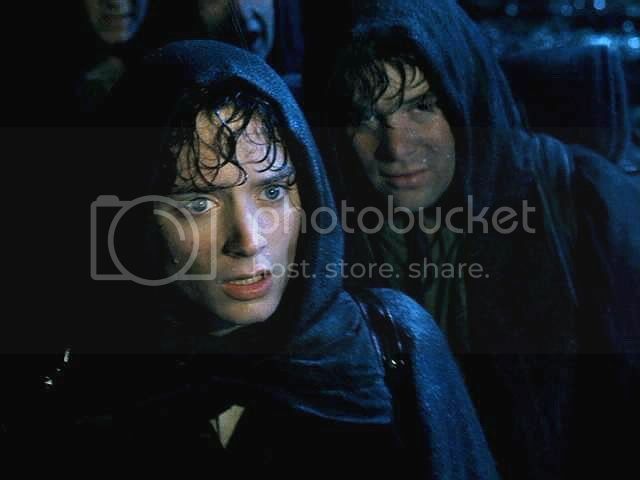 Darn, he looks good wet. Yes, he does look nice thoroughly wetted in these. But, totally wet did nothing for me (Frodo having been pulled from the water in the Dead Marshes, however amusing the gif was of him emerging with looped hip thrusts). Do you remember that? Ariel had put it on her LJ. I wasn't on LJ at that time, but I saw it eventually. 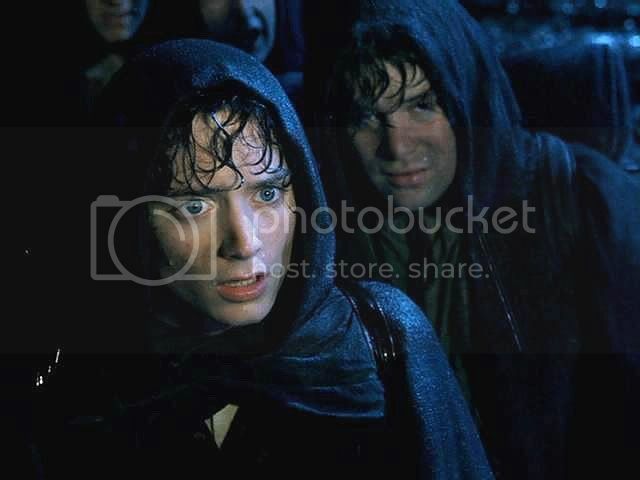 Gollum dragging him out of the water on his back, Frodo kicking his heels trying to get some purchase. Pelvis up when the heel thrust into the bank, back down when the heels slipped. Over and over. My, my eyes watered. I love his expression in the next scene, when they step inside the Pony. *points to icon* His "whew!" is so obvious. I'm never in doubt what Frodo is thinking or feeling, when I watch Elijah's portrayal of him. Yes, those shots just after they've entered, looking up and making inquiries to Mr. Butterbur, than all the business at the table, the Ring-strokings with his eyes closed.... Oh! And, worse, the frames that come from the last bit in Bree, when he is sitting on the edge of the bed upstairs, after the Wraiths have ransacked their room, listening to Aragorn deliver his direwarnings. Again, we need to coin some new superlatives. Like the Inuit are supposed to have myriad words for snow, seeing so much of it most of the year, we need more words to describe Frodo's beauty. Then we can gush in better detail when it comes to singing his praises. Like the Inuit are supposed to have myriad words for snow, seeing so much of it most of the year, we need more words to describe Frodo's beauty. Great idea! After all, we have that face, that skin, the tout ensemble... excuse me, am I drooling? OK, get to work, start making up some words. Actually, the Harem has already made a good start, but those tend to talk about body parts and certain expressions rather than being descriptives. We need some alternates to "gorgeous," "ravishing," "fantastic," "scrumptious," etc. Yeah.. he looks nice wet. Like he needs rescuing just enough to stimulate my protective instincts pleasantly but not so much that it hurts and makes me feel impotently frantic like when he is so panic stricken in Shelob's Lair. Ooh, ooh -- how about a, Frosaurus? This is my third try - I hope it works this time. "Succulent," "luscious," "toothsome," yes, yes. Very good, Este. the young, dewy look of those lips so many of us have longed to pluck and taste like early-summer fruit. You have a wonderful way with words:D Your screencaps are great and such good quality, really clear. Mine always seem to be slightly fuzzy. Have to agree about the gorgeous chin, I've always loved the slight cleft (just as described by Tolkien!!). So glad hobbits don't have beards!! Have to agree about the gorgeous chin, I've always loved the slight cleft (just as described by Tolkien!!). He's fairer than Arwen! Than Luthien! Than Galadriel! Than Idril! Than the whole host of the Vanyar together! Than the stars of Elbereth! Oooh, "fairer than the stars of Elbereth." I like that, I do! It's ALL said above. He is adorable, beautiful, gorgeous ...Amen! It is my pleasure to make and post and talk about them, Julchen. I have not seen your posts here before. If you don't know, I keep a table of contents to the links for all the screencap posts, posted under "Links" on the main entry page (left-hand column).